On Saturday, my wife and I went to the Lake in the Hills Air Expo 2006. 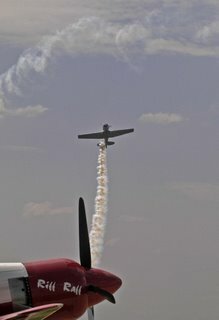 The displays and performances were great, but I found that I was most interested in watching how the pilots handled the strong cross winds that prevailed that day. I watched every landing and studied how they fought for the centerline. Because I am at that point in my own training, I learned a lot just by watching the pros. It rained most of the day on Sunday but I did get a lesson in. Other students from the school tried to go out to the practice area and had to come back because of low ceilings. We didn’t even try to go anywhere else, just stayed in the pattern and worked on landings again. It was raining a little most of the time but, the wind was very light. Not fighting a cross wind allowed me to concentrate more on the flare. I almost have it nailed. My only problem now seems to be remembering to look the proper distance down the runway as I level off from the approach. If I look too close, I flare just a little higher than I should. If I look in the right place, my flare is pretty good. The other thing that needs some fine tuning is how much back pressure to use. I still have a tendency to balloon. It certainly isn’t as much as it was but, I still do balloon too often. None of my landings were really bad, some just ate up more runway than necessary as I had to use a little power to keep from dropping it in. Sandy pulled the power abeam the numbers on one pattern and I handled that landing fine. On my last pattern of the day, the tower control asked for a short approach. I cut it a little too short and landed long but not dangerously so – within the first third of the 6000 foot runway. All in all, it was a good session. I saw improvement and, more importantly, so did Sandy. The big issues seem to be under control and we are working on the picky details of takeoffs, patterns and landings now. I wish I knew about that Expo at Lake in the Hills. I’ve got a buddy that lives out that way and it would have been nice to drop in. Maybe next year. As it is, I’ll likely miss the Waukegan Open House – depending on when the little’un arrives. The open house at Skill Aviation is this Saturday from 10-4. Hope you can make it – baby permitting. It would be great to meet up.